The 2019 NFL schedule is out and DraftKings Sportsbook is wasting absolutely no time offering action on the games—not just Week 1 games—but also every Eagles, Giants, and Jets game Weeks 1-16. Eagles fans will be happy to know the team is favored to win 12 of their first 15 games. They are most heavily favored over the Redskins and Lions (-8.5) and a strong favorite over the Giants at home (-8). The Eagles are also favored in every home game, including a modest one-point favorite over the Patriots. All three games in which they are underdogs are on the road: Vikings (+3), Packers (+1.5), and Cowboys (+1.5). Unfortunately for Giants and Jets fans, the odds at DraftKings aren’t quite so good for their squads. The Jets are favored in only 5 of 15 games and the Giants are favored in only 3 of 15 games. The NBA Playoffs are upon us and as the action heats up on the hardwood so, too, does the action at the best NJ online sportsbooks. Let’s take a look at the Sixers-Nets odds and betting predictions. 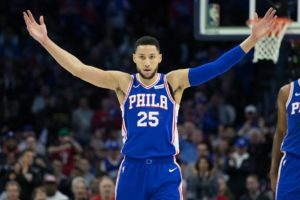 Pro tip: If you want to bet on the Sixers to win the series, do so at PointsBet with the considerable value price of -501 and get a $50 free bet with no deposit and up to $1,000 in risk free bets with code BROADLINES. Over at FanDuel Sportsbook, you can grab a decent deal on the Game 1 moneyline while also taking advantage of their NBA Parlay Insurance offer. Place a bet of 4+ legs on any game during the playoffs at moneyline odds of -200 or greater. If you hit all but one of the bets, FanDuel will help ease to pain by offering a cash refund of up to $25. Joel Embiid doesn’t know if he’ll play and it sounds like he’ll be a game-time decision.